June 10, 2017 by admin | Filed under General. It’s well known that Amazon is loved by online shoppers, mainly due to its amazing customer support. Amazon is now a lot more than a big online shop, as they annexed a bunch of other businesses to it. One of which is a publishing business. This department unfortunately can’t be called amazing. Here is my little story to showcase what’s happening behind the scenes and how injustice is done to the long tail. As of this writing I have published 4 books. First with O’Reilly and Associates, second with Onyx Neon Press, and the the most recent two I self-published via Amazon KDP (Kindle Digital Publishing). Publishing via KDP was OK, they still have a long way to go to make things smooth, the main gift to us was to make it possible to publish books without needing to convince a mainstream publisher to want to publish them. When things work, they work, when there are problems, usually after stumbling through a few clueless support people, eventually you hit someone who knows their business and things get resolved. All was good. Recently I started studying a fascinating science of Reichian Therapy, and stumbled upon a manuscript by Jack Willis, called “Reichian Therapy – The Technique, For Home Use”. Copyright © 2007 by Jack Willis. Jack Willis passed away in 2010 and his site is now gone, but luckily waybackmachine did it again and it has a copy of the site here: http://reichiantherapy.net. I wanted to make the text readable on an ebook reader, so I OCRed the pdf, fixed spelling errors and typography issues, and spent a lot of time reformatting it for a digital book usage, merging paragraphs, moving images and footnotes to where they belonged in the text, etc. After that I decided that others will probably benefit from this text as well in its digital format and decided to upload it to my KDP bookshelf. This was something new, and I read through the materials KDP supplied on the issue of copyright, it seemed to me that based on the quoted above authorization from the author I was doing the right thing, so I made a nice book cover for it and uploaded the manuscript. At the moment of my uploading there was only a print version of the book available from a large publisher “New Falcon Publications”, which they published in August 21, 2013, and which they sell for $40. They renamed the book to: “Reichian Therapy: A Practical Guide for Home Use“. I supplied the documentation emailing them the pdf released by the author and quoting the authorization I pasted earlier in this article. Prior to your submission, we received a notice and takedown for a book that matches to yours, from a third party claiming that the distribution of the book above was not properly authorized due to copyright infringement. We don’t involve ourselves in third party disputes and because we have not received any communication from the involved parties that the matter has been resolved, we have determined that we will not be making the book(s) available for sale on Amazon at this time. As a result of that, the entry for that book on my Amazon KDP bookshelf had a big BLOCKED on it (unfortunately no snapshot). After a bit of thinking I realized that probably the conflict they referred to was with “New Falcon Publications”, who obviously doesn’t want competition, yet they won’t make the effort to release a kindle version of the book. Why? Let me guess – probably because $40 is much better than maximum $9.99 one can sell for a kindle version of any book. My only guess is that whoever published the digital version before me received a takedown notice from “New Falcon Publications”, because if you follow the money trail, there is nobody else who currently profits from this book. I replied to KDP support, saying that I understand the situation and please remove that blocked entry from my bookshelf. At this time, it is not possible to completely remove an unpublished book from the Bookshelf. I’m sorry if this may cause you any inconvenience. OK, I said, weird, but what to do. I moved on. Having done the work, I didn’t want it to go wasted, so I made it available for free on my website under Reichian Therapy. As part of the termination process, we will close your KDP account and the related CreateSpace account (if any) and remove the books you have uploaded through our channels from sale on Amazon. Note that you are no longer eligible to receive unpaid royalties for sales that occurred prior to this termination. Additionally, as per our Terms and Conditions, you are not permitted to open any new KDP and/or CreateSpace accounts. Thank you for the email concerning the status of your account. After reviewing your response, we have reevaluated the Content Guideline violations relating to the books in your account. We found that you have uploaded material through your account for which you do not have the necessary rights. 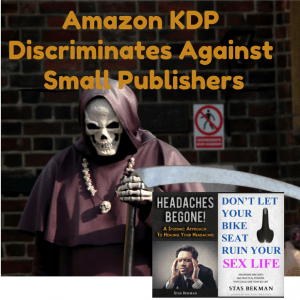 As a result, we are upholding our previous decision to terminate your KDP account and remove all your books from Amazon. If you have any questions regarding this issue, please email us at content-review@amazon.com. I hope you can see the obvious. I next called KDP trying to talk to someone, who could explain, what the real problem was. You can’t call KDP directly, so you call normal Amazon customer support 1-866-216-1072 and press 0 to talk to an agent. This is general customer service, tell them you want to talk to KDP, they will check your identity and transfer you to KDP. Ideally, have some recent amazon.com order number available if you have such, otherwise it’s going to take one hour or so for the usually incompetent agent somewhere in 3rd world to find and validate your account. One time the agent claimed that I was shopping with Amazon Mexico! When I’m from Canada and have never used Amazon Mexico in my life. After the very inefficient process of validation I was redirected to someone who listened to my story and told me that that my account got closed due to a ransomware virus on my computer. He was very sure of that. It took me a few moments of bewildered surprise to connect the dots and realize I was talking to a wrong person. After realizing that, I discovered I wasn’t redirected to KDP support, but I was talking to yet another clueless person at tech support. An hour later with a bunch more validations I reached someone at KDP. It immediately felt that I reached a higher place, since the tone of voice on the other side was intelligent and caring for a change. I was relieved. After telling my situation I was redirected to yet another person, who listened to me, said that there is no way to contact the content review team and that he (Chris) will inquire for me and get back to me in 2 business days. I said thank you very much and waited. One odd thing Chris told me that if the content review team doesn’t solve the problem he said just open another account and we will transfer all the book reviews from the old account to the new one. This is despite content review team threatening me in every email from them that I’m not allowed to open another account with KDP and if I do they will never pay me a cent. Hello, Amazon?! Can you decide on your policies and not provide misleading information? A week passed by, and nobody contacted me. So I contacted KDP again, again going through many agents before reaching the right people, patiently waiting for the strangely untrained agents who again and again asked me to validate my address and often not being able to do so. Yet, eventually I reached KDP again and telling my story twice I was redirected to someone senior (Karthis), who again asked me to tell the story, and said it makes sense and that again he can’t talk to anybody at content review and that he will prioritize this issue for them to get back to me within 2 biz days. Another week passed by with no reply from anybody. I called KDP again, [fast forward the painful reaching them process], and after several bounces again reached Karthis, who promised the same thing. I objected and said that nothing will be different, and can you please talk to someone in person and tell me the real reason for the termination. The answer was the same, he will prioritize it even more. We’ve reviewed the information you provided and we are upholding our previous decision to terminate your account and remove all your books from sale on Amazon. As a result, we will not be reinstating your account. Please note that, per our Terms and Conditions, you are not permitted to open new accounts and will not receive future royalty payments from additional accounts created. Obviously nobody wants to tell me the real reason for the false allegation. Amazon, wake up! We authors make money for you! You won’t have existed if it weren’t for people giving you stuff to sell. We appreciate the platform and the convenience, but you have just shut down an author, who wrote honest books, for some kind of mysterious conspiracy BS, that you don’t even have the guts to disclose. So Amazon still sells books by a criminal, which they alleged me to be. This is so inconsistent and illogical. The bottom line is that my effort to make a copyright-free digital work, that is no longer available, accessible to public, backfired with Amazon shutting down my account and banning me from ever publishing books with it. Very nice job, Amazon. I don’t really care for my account reinstating, since I will not ever work with Amazon KDP again out of my own choice. I don’t work with people or companies, who lack integrity, play ambiguous games and display so much incompetence. It’s just sad that the company won’t honestly communicate with authors, who they rely on to make their profit. p.s. I patiently waited for almost 3 weeks hoping this gets resolved, but clearly the one thing KDP wouldn’t do is to admit its mistake and reinstate my account. Meanwhile my books have been unavailable for sale. I need to start looking for a new publisher. If you have a good experience with a different publisher, please kindly share. My recent 2 books are in the self-help/health category.